The Moulin de la Tour is a 16th century walnut oil mill in Saint Nathalene, 9 km from Sarlat. Although they specialize in walnut oil from locally grown walnuts, they also make oil from hazelnuts and almonds. The Perigord is noted for its walnuts and they are delicious. The nuts are opened by hand with a special hammer. It is a very slow work and it is done by “older people” to supplement their income. The walnuts are then crushed into a paste. 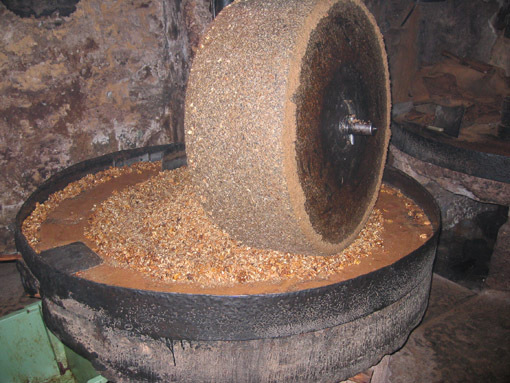 It is done with a mill stone the same way one would make olive oil. The walnut paste is then put in a cooker that spins the paste around as it heats it (unlike good olive oil which is cold pressed). Some of the locals bring their walnuts to be pressed and wanted it done at a higher temperature. This gives them more oil but gives it a harsh taste. It is then put into a press which is lined with a heavy cloth and weights are put on top and then it is pressed. The mill is powered by a water wheel that turns a drive shaft connected to all three machines. Our guide told us that there were 10 mills along the river that made both walnut oil and flour. In the 1970’s they all stopped making flour and today Moulin de la Tour is the only one left making walnut oil. The leftover flour (paste) is used to feed the animals but you can still find it made into a cake as it was in the past. In fact the peasants in the middle ages paid off their debts with walnut oil.